well hung .., i mean sung :) - A mummy's inane blabberings..
theoi just gave me the link to a clip of Will's audition. Here it is... U need the latest Realplayer to be able to view it. Go here to view clips of the best and worst of the auditions according to USA Today..Mr Pen Salesman and the lightning/thunder lady are all there! Oh and do u know that the Asian guy, Bao Viet Nguyen baozer who made it to Hollywood has a livejournal too. Really cool coz u get to read an insider's pov of his experience as one of the auditioners! Serious? He has a pitch? Lemme listen now! how how??? not bad hor hehe..
OMGOMGOMG.... you are a goddess! I love the guy -- what a good sport! But like I said elsewhere, he's no Keith. There is, and will forever be, Only One Keith. he was indeed a good sport..he accepted rejection well enuff and honestly, he wasn't really that bad vocal wise..just that he wasn't idol material and his gongfu shebang moves detracted a li' :D..But he will be remembered fondly..
We should get together one day and watch AI ..get YH to download all the earlier auditions too! Since it got so many hits, so popular... can he be labelled as "American Idol" huh??? heh well, i have to say that William Hung came out a 'winner' even tho he din make it to the next round..esp if u see how many fans he has garnered. Ya yA... I admire his courage, and sporting spirit!!! i caught bits of it last week and was going huh when some sang. but i admire their courage. heh oh man..the auditions are the best part of the show..too bad. This time round, there seem to be more asians auditioning too..
hehe..u mean u~ he's such a sweet guy hehehe..oh man..im gushing! Wah, how did you know all these? Even the journal!? 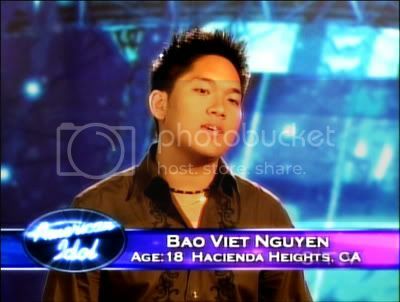 I like that Viet guy's voice though. Man, I'm seriously addicted to AI. heh i've been hooked on American Idol since the first installment..thankfully, i was in Mediacorp then so i managed to watch tapes of AI 1.. Heh..I googled on AI news and also, twop (www.televisionwithoutpity.com) and this site : http://www.sirlinksalot.net/americanidol.html was a treasure of info.. I just heard the mp3, he's not bad! heh..really eh..he actually hit the high notes pretty well..:D..Now to get hold of the clip of his audition kekeke. oh yeah!! Will hung was like the hunk larh LOL so farnie! Ohhh yeah tts the Vietnam guy! quite handsome eh! hahaa nad he has a livejournal..coool! listened to the mp3, and his rendition is actually not too bad. other than the distracting accent, his pitch and timing was spot on! heh..his movements/dancing was kinda distracting too hehe..
Alas..the auditions are the best parts..! wah lau eh .. this is so darn funny! I cant take the image of him dancing out of my mind!!!!!!!!!!!!!!! omg!! my family and I killed ourselves laughing when he sang!!! and he's like "I have no professional training" and Simon's like "That's the surprise of the century" and he started laughing but I have to agree he had the best attitude of everyone that auditioned!!! good for you Will!!! heh..simon was caustic as usual but he didnt pull all his punches at least..Paula was really nice i thought..i think she could see how sincere he was..Randy probably lost it midway tru the song..